The Water Survey of Canada - FTS Inc. The Water Survey of Canada, a division of Environment Canada, is a federal government agency responsible for collection, interpretation and dissemination of water source data and information. As a division of Environment Canada, the Water Survey of Canada (WSC) covers a vast range of topographical environs from Arctic Canada to the US border with elevations varying from sea level to over 13,000 feet (4,000 metres). An estimated 7% of the world’s renewable water supplies are found in Canada. Canada’s hydrology is incredibly diverse thanks to a wide range of bio-physical ecozones. 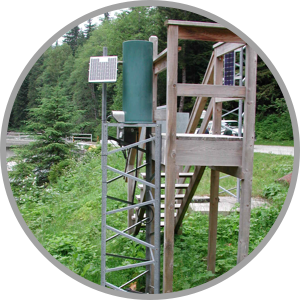 WSC operates in partnership with all of the Canadian provinces, territories and other agencies, operating over 2,500 active hydrometric gauges across the country. The hydrologic and socioeconomic diversity found in Canada makes water resource management incredibly challenging. In 2011 WSC named FTS as the primary supplier of dataloggers in a 2-year contract worth $1.7 million. In 2012, WSC elected to extend the contract for a further 2 years. The push to incorporate the rugged yet simple-to-use Axiom H2 datalogger is part of a national strategy to lower costs and increase the reliability of remote monitoring stations. Technicians performing field visits are often on the road for days at a time, and the Axiom’s integrated touchscreen reduces the amount of gear required to visit a site, which is often reachable only by helicopter. Native support for a large number of sensors and easy to use graphical interface also reduces a technicians’ time at the site. As of the end of 2013, WSC has deployed more than 800 Axiom dataloggers and DCPs over 3 years.